Awkward stage direction can turn an otherwise good scene into a clunky mess. But the right balance of action and character thought lets the reader sail on through. No matter what type of novel you’re writing, at some point you’ll have to describe how the characters move about and interact with the world—the stage direction. Like the theater, you’re directing how your “actors” move on the stage (or the page in this case). Basically, it’s describing the physical actions the character makes. Jill walked into the hotel room and shut the door behind her. She couldn’t believe she was here. She dropped the card key onto the dresser, then slipped off her coat and hung it over the back of an empty chair. She needed a drink, maybe two. Grabbing a glass from the plastic-covered stack on the table, she twisted open a bottle from the minibar and poured herself a bourbon. She looked around and frowned, set the glass down, picked the card key back up, and grabbed the ice bucket. Then she walked down the hall to the ice machine and filled the bucket, carrying it back to her room in both hands. She listened at the doors as she passed. She knew that sleaze ball was in one of them right now. Back in her room, she picked up the plastic tongs and dropped a few cubes into her glass, then took a much-needed sip. Bored yet? Probably, because there’s no reason to see Jill go through the myriad of things one does when entering a hotel room and fixing a drink. It also puts the focus on the least interesting parts of the scene—the physical movements—and practically ignores why she needs that drink or why she’s there. Jill walked into the hotel room and shut the door behind her. What was she doing, coming here? She dropped the card key onto the dresser, then slipped off her coat and hung it over the back of an empty chair. She seriously needed a drink. Maybe two. Grabbing a glass from the plastic-covered stack on the table, she twisted open a bottle from the minibar and poured herself a bourbon. She looked around and frowned. No ice. She set the glass down, picked the card key back up, and grabbed the ice bucket. “At these rates, you’d think they’d fill the bucket for you,” she mumbled as she walked down the hall to the ice machine. She filled the bucket and carried it back to her room in both hands. She listened at the doors as she passed. Which one was that sleaze ball in? Back in the room, she put the bucket on the desk, picked up the plastic tongs and dropped a few cubes into her glass, then took a sip. She needed it, bad. Not much better is it? Even with the additional typically fast-paced elements (dialogue), it still drags and describes things we just don’t need to see. Just adding the personal character elements aren't enough--so let’s get rid of most of that stage direction. Jill walked into the hotel room, hardly believing she was here. She seriously needed a drink. Maybe two. Twisting open a bottle from the minibar, she frowned. No ice? She grabbed the bucket. “At these rates, you’d think they’d fill the bucket for you,” she mumbled, filling it with ice. She listened at the doors on the way back and wondered what room the sleaze ball was in. She took a sip of her now-cold drink. Man, she needed that. Whoa, whoa, whoa...Feel jerked around? Probably, since now there’s not enough stage direction to make it clear when and where Jill moved and what she did when she got there. On a second read you can figure it out, but we don’t want to force readers to read things twice just to understand our stories. Let’s try one more time and aim for a balance between internalization, dialogue, and stage direction—but this time, let’s also think about how that stage direction can show not only what Jill does, but how she feels and what’s going on in her life. Jill walked into the hotel room and dumped her coat over a chair. Was she actually going to do this? She seriously needed a drink. Maybe two. Not that the minibar was cooperating—nothing but bourbon, and no ice. Just great. She snatched up the ice bucket and the overly cheerful keycard and hunted down the machine. Naturally, on the other end of the floor. “At these rates, you’d think they’d fill the bucket for you,” she mumbled as the ice rattled down the chute. Stupid ice. Stupid bucket. Stupid overpriced no-tell ho-tel. On the way back to her room, she listened at each door, gripping the bucket tight against her chest. No snotty laugh, no familiar voices, but that sleaze ball of a husband was here somewhere. That jerk. She kicked her door shut behind her and went to the bourbon. Drink. Now. Same basic details, but this version was hopefully more interesting to read, and moved Jill smoothly to the ice machine and back. 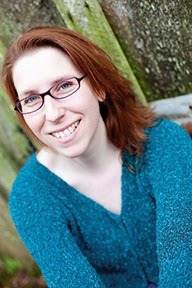 There were enough details to clue readers in that she’d moved, but also gave her things to do at each location that shed light on her goal and character, and gave a stronger sense that something was going to happen. Let readers fill in the blanks: Think about the stage direction as a dotted line. Give enough details to show the line and where it’s going, but let readers fill in the obvious missing pieces. Skip the obvious: If readers will know the various steps to do something (such as starting a car, or getting dressed), there’s no need to describe them. Flesh out whats not obvious: If readers won’t be able to figure out a character’s actions or movements, then focus a little more on what she’s physically doing. For example: Disarming a bomb, or moving through an unusual setting. Add the character’s personality: Remember the point of view. “Look” can mean many things depending on who’s doing the looking—an angry character might glare, a love-sick one might gaze, and a scared character might peek. Stage direction can be a pain to write, but it’s easier if you remember it can do more than just direct the action. Let it work for you, and it can be a useful tool to bringing your scenes to life. How do you feel about stage direction? Who do you feel does it well? 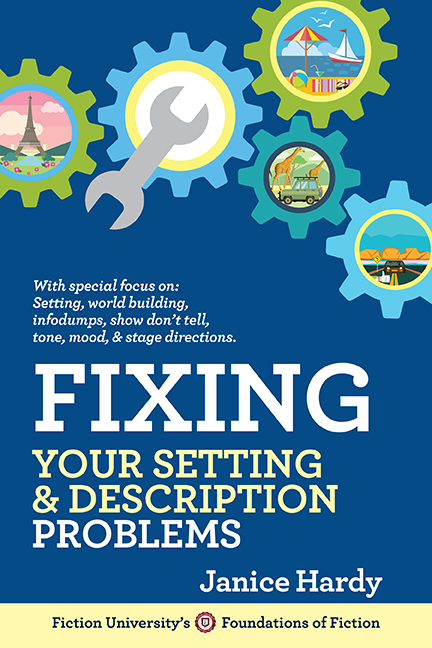 Find out more about stage direction and more, in my book, Fixing Your Setting & Description Problems. Great post. Stage direction is one of those little things that can make or break a scene, but few people pay any attention to it. And when they do, they get confused with the whole "show, don't tell" thing. I admit this is a part I struggle with. I believe I do well staging actions, but I use it a lot to showcase how my characters are feeling at any given point: small physical clues to act as subtext for the conversation or their actions rather than describing the actions themselves. Problem is, I love doing that, so I always have to be mindful of not going over the top! Specially with "looking" and "casual touching". My weak spots! Thanks for sharing this post. It was a great way to look at this aspect of the craft with a fresh pair of eyes and a critical point of view. Another helpful post. It's so helpful to see all the renditions too! This is great. I need help and practice taking my stage direction to this next level of supporting character goal, conflict, etc. So helpful, especially showing the various renditions. More please!! Thank you! I have a couple paragraphs on page one that are in bad need of internalization. This post helped enormously!